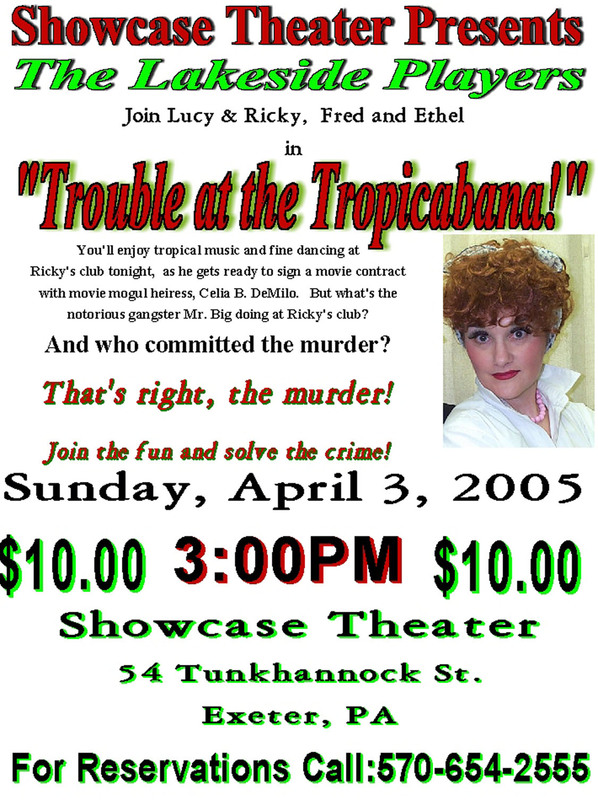 Sunday April 3 @ 3 p.m.
Take a walk down memory lane with Lucy, Ricky, Fred, and Ethel when The Lakeside Players present Trouble at the Tropicabana at the Showcase Theater in Exeter, PA. You’ll enjoy Latin music and dancing at Ricky’s club tonight, as he gets ready to sign a contract with movie mogul heiress Celia B. DeMilo. Is Celia who she claims to be? Will Lucy and Ethel ruin Ricky’s big chance with another of their harebrained schemes to get into show business? What’s the notorious gangster Mr. Big doing at Ricky’s club? And who committed the murder? The murder? That’s rightthe murder!